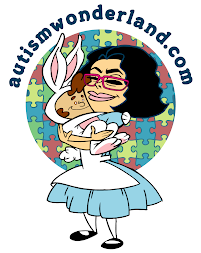 AutismWonderland: "You look really tired..."
I must admit, I hear this a lot: You look really tired. In fact, I just heard it a few hours ago. As if I didn't know. As if I didn't look in the mirror every day. As if my tube of under eye concealer goes untouched. I cannot help but wonder what is the use of night-time facial creams, de-puffing eye massage serum and department store cosmetics if the result is: You look really tired. As if my exhaustion is fighting its way through my carefully applied make up. And I guess it's because I am really tired. Because I didn't really sleep last night. Or the night before. Let's face it, I haven't had a good nights sleep in more than two years. Our days consist of therapists, evaluations, school tours and applications. EIPs, CPSE, CSE, OT, PT, ABA, BCBA and other abbreviations that do not make sense until absolutely needed. I don't go to bed till after 11. And by the time I fall asleep - maybe 12. Often I wake up around 4 in the morning - running through my mental to-do list, hoping I can bore myself into a few moments of peace before the alarm clock rings. And then the boy doesn't sleep. Though, I admit - it's gotten so much better. We used to give him "night time candy" (melatonin) to help him relax and calm down so that he could go to sleep. But then he would wake up at 2, 3 or 4 in the morning with so much energy and stay up for hours. Now that we've taken him off melatonin, he's sleeping better. Though he still wakes up in the middle of every night and wedges himself between me and Joseph. He'll toss and turn and squirm for a while before finding that perfect position - all forty five inches taking over the width of our queen size bed. I suppose a fat flat foot in my face is better than having to physically get up and bed hop until the boy falls back asleep. I used to make such a big deal, spending hours of precious sleep ushering him back to his room. Arguing, reasoning with a boy that could not be argued or reasoned with - least of all at 3 am. Now I could care less. If it allows me one more hour of sleep, I'll take it - gladly. I am hopeful, very hopeful that he will grow out of it. I didn't get a full night's sleep until Alex was 1.5 and then six months later Aly was born. Alex wouldn't sleep... he wouldn't wake up like clock work, 1:30am, 4:50am and 6:15am. Every day for 1.5 years and then again when Aly was born and when he started center-based services. I am still waiting for the next time I have a full night's sleep. Aly is on the same type of sleep wackness. She wakes at 12:20am, 2:45am and 4:35am. Tired is my middle name and coffee is my BFF! I enjoy your posts so much. I'm fortunate that my girls have always been pretty good sleepers, aside from the growth spurts and occasional thunderstorm.